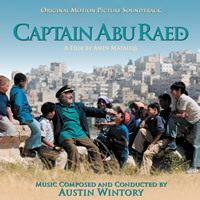 BUYSOUNDTRAX Records will be releasing CAPTAIN ABU RAED, featuring music composed and conducted by Austin Wintory for the 2009 drama written and directed by Amin Matalqa and starring Nadim Sawalha. CAPTAIN ABU RAED tells the story of Abu Raed, an old airport janitor who has always longed to see the world but has never been able to afford the ticket to travel. One day, he meets a group of children in his poor neighborhood who mistake him for an airplane pilot and beg him to share stories of the world outside of Jordan. Through his imaginary stories, Abu Raed makes new friends and learns about the grim realities of their home lives. He is ultimately able to inspire the children and change their lives. For CAPTAIN ABU RAED, the director was looking for a Western sound, instead of the typical Middle Eastern orchestral color an audience would be used to hearing in a film set in this part of the world. The film would need a universally romantic score that would affect an audience in any part of the world. To satisfy this requirement, the director turned to composer Austin Wintory. After meeting to discuss the score for another project, both men recognized a similar love and respect for film music and that a collaboration between them could be successful with this common language to communicate. His first film score, composed for the silent short, NUTS&BOLTS, directed by Newell Todd, won the Golden Silent Series score competition and received a double performance live at NYC's Lincoln Center, synched to the film. Austin received separate awards for two brass quintet works, a woodwind quintet and string quartet, as well as an orchestral work. He later received the Alan Menken Award, a distinction given annually by the legendary Disney composer. Austin has remained busy composing a slew of scores for nearly ninety productions, ranging from short and feature films, to computer games, TV shows and commercials, corporate videos, podcasts, video art installations and even books on tape. He has also had success as a concert composer. His concert works have been performed through various Manhattan venues, and across the pond in Europe. His commissions include works for the Black Sea Philharmonic in Constanta, Romania, two orchestral works for the Charlotte Symphony Orchestra in Port Charlotte, Florida, a chamber work for the Colorado Music Teacher's Association and an orchestra piece for the Colorado Youth Symphony and, for the Thorton Symphony Orchestra at the University of Southern California, "Space, Time and Plexiglass", in honor of the works of filmmaker Joss Whedon.